Showing items in category Gambia, sorted by newest listed first. GAMBIA - 1912 1d deep rose PSC unused. H&G 9. 1912 1d deep rose on buff postal stationery postcard in fine unused condition. H&G 9. 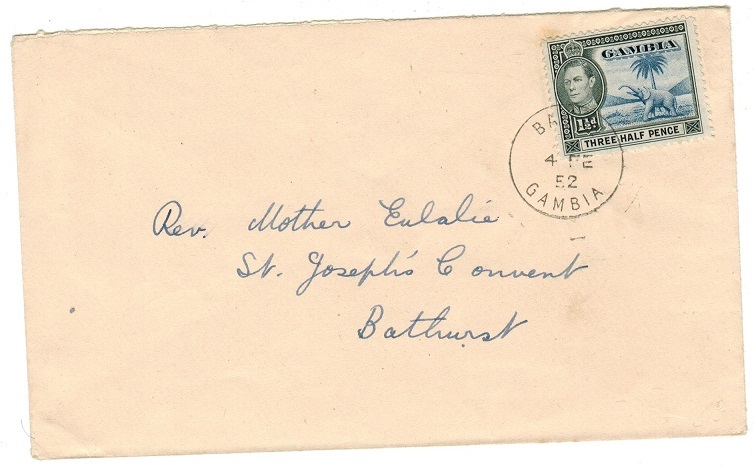 GAMBIA - 1923 4/- rate registered cover to UK used at BATHURST. 1923 (MR.7.) 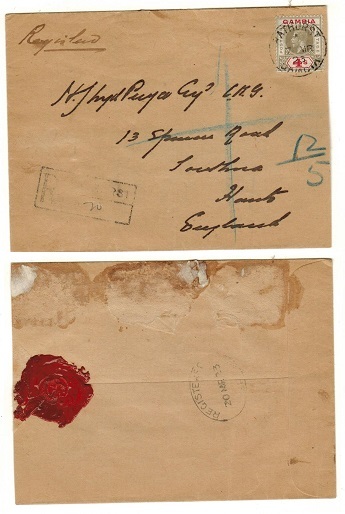 registered cover addressed to UK (slightly reduced at right from opening and with some glue marks at top reverse ) bearing the 4/- black and red adhesive (SG 117) tied by BATHURST/GAMBIA cds. 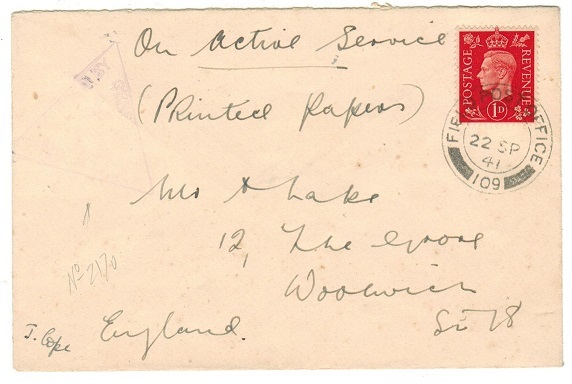 A scarce franking with this elusive stamp on cover. 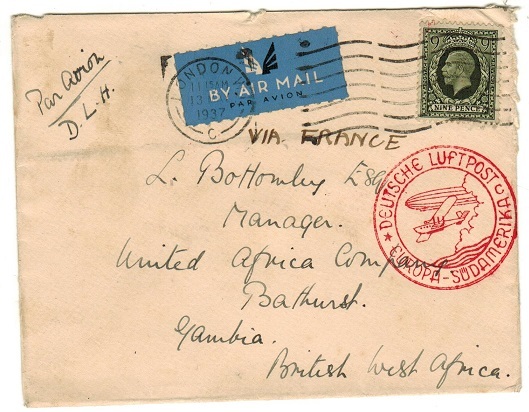 GAMBIA - 1938 inward 'DEUTSCHE LUFTPOST' cover from UK. GAMBIA - 1948 10d rate registered cover to UK used at Mac CARTHY ISLAND. 1948 (JA.19.) 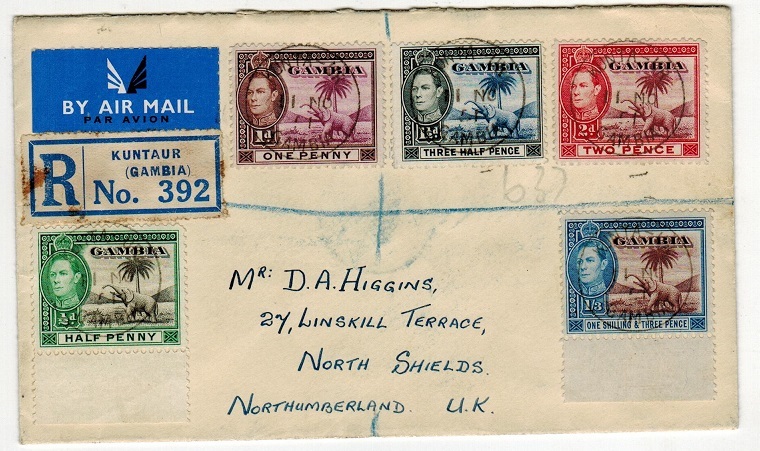 registered cover to UK bearing 2d, 3d and 5d adhesives tied by oval REGISTERED/ Mac CARTHY ISLANDS GAMBIA cancels with blue on white perforated R/GEORGETOWN registered label at lower left. The '48' in year slug being in a different font. GAMBIA - 1886 4d deep brown 'Cameo' mint sheetlet of 15. SG 31. 1886-93 4d deep brown 'Cameo' adhesive in a fine mint sheetlet of 15 from the 1st comb perf showing the two additional dots added in right margin. SG 31. 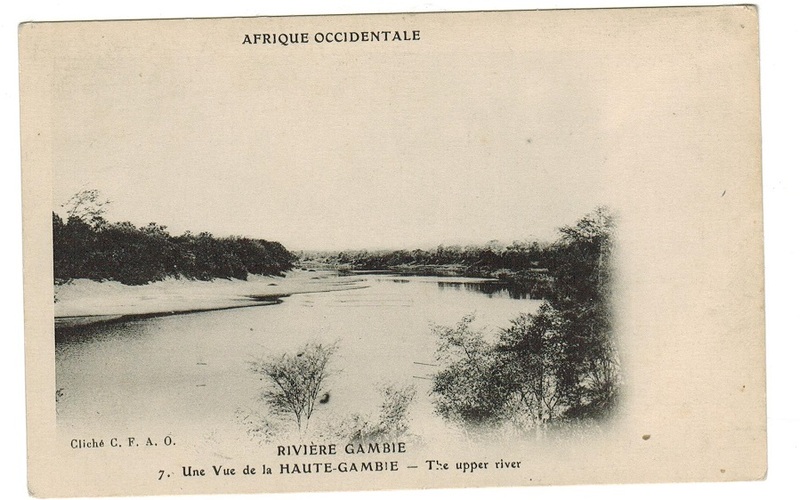 GAMBIA - 1953 'TPO NO.2/RIVER GAMBIA' cover registered to UK. 1953 (JU.9.) registered cover addressed to USA bearing 'KGVI' 1d, 1 1/2d and 3d adhesives each tied by TPO No.2/RIVER GAMBIA cds's. GAMBIA - 1902 2/6d purple and brown on yellow mint with SPECIMEN applied in black. SG 55. 1902 2/6d purple and brown on yellow in fine mint condition with SPECIMEN applied in black. SG 55. GAMBIA - 1902 1/6d green and red on yellow mint with SPECIMEN applied in black. SG 53. 1902 1/6d green and red on yellow in fine mint condition with SPECIMEN applied in black. SG 53. GAMBIA - 1886 1/2d deep orange 'Cameo' mint handstamped SPECIMEN in black. SG 25. 1886-93 1/2d deep orange 'Cameo' in fine mint condition handstamped SPECIMEN in black. SG 25. 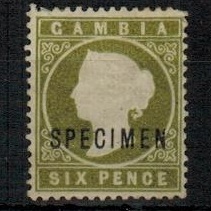 GAMBIA - 1886 6d yellowish olive green mint SPECIMEN. SG 32. 1886 6d yellowish olive green adhesive in fine mint condition (blunt corner perf at top right) with 'CA' watermark sideways to the left handstamped SPECIMEN in black. SG 32. GAMBIA - 1953 3d+2 1/2d dark blue RPSE to UK uprated at BATHURST. H&G 6. 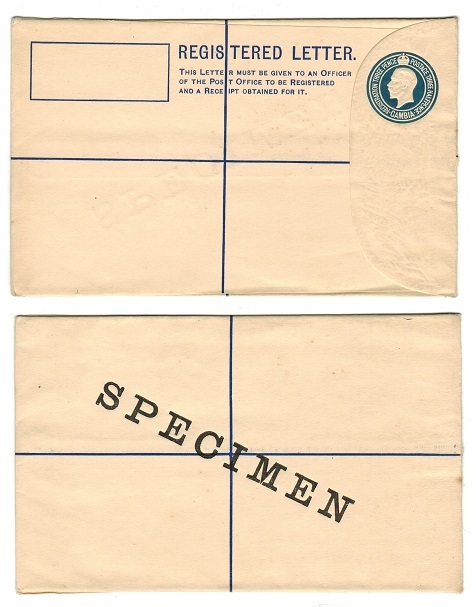 1953 3d + 2 1/2d dark blue on cream registered postal stationery envelope (size G) addressed to UK bearing 1/2d (x2) and 1/3d 'Red Cross' adhesive tied by oval REGISTERED/GPO GAMBIA cancel dated 24.SP.63. H&G 6. GAMBIA - 2000 D12 'Apollo' adhesive u/m with major variety MISSING COUNTRY. SG 997. 2000 D12 Recovery of the Apollo 11' adhesive in fine unmounted mint condition showing the major error COUNTRY TITLE OMITTED. SG 997. GAMBIA - 1958 6d dark violet brown air letter to USA used at BASSE but returned. H&G 7. 1958 6d dark violet brown on blue postal stationery aerogramme addressed to USA (long genuine message) cancelled by BASSE/GAMBIA cds dated 6.OC.57 (the year prior to H&G's issue dated) struck by numerous magenta handstamps including CANNOT BE FOUND and RETURNED FOR BETTER ADDRESS. H&G 7. GAMBIA - 1985 use of 60b blue air letter uprated to Germany. 1985 (SP.9.) use of 60b blue on blue postal stationery air letter addressed to USA (genuine use) bearing additional 50b adhesive with dark brown-red on white POST OFFICE/EXPRESS/DELIVERY label below. GAMBIA - 1978 use of 30b red air letter uprated to USA. 1978 (DE.7.) use of 30b red on blue postal stationery air letter addressed to USA (genuine use) bearing additional 25b adhesive with dark brown-red on white POST OFFICE/EXPRESS/DELIVERY label at lower left. 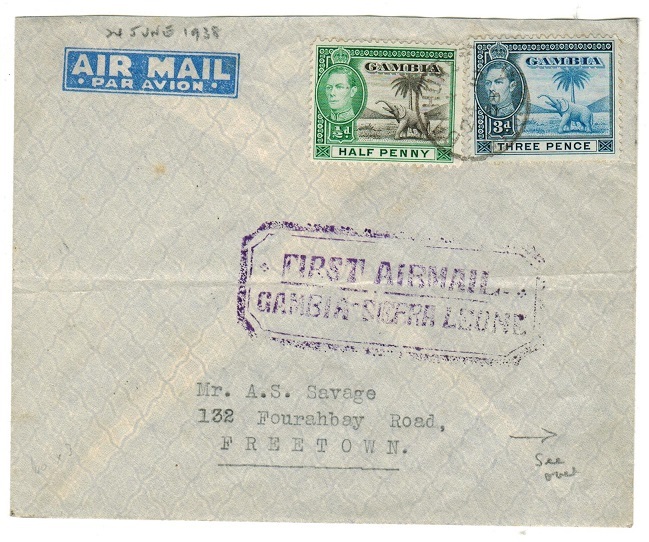 GAMBIA - 1938 first flight cover to Sierra Leone. 1938 (JU.24.) 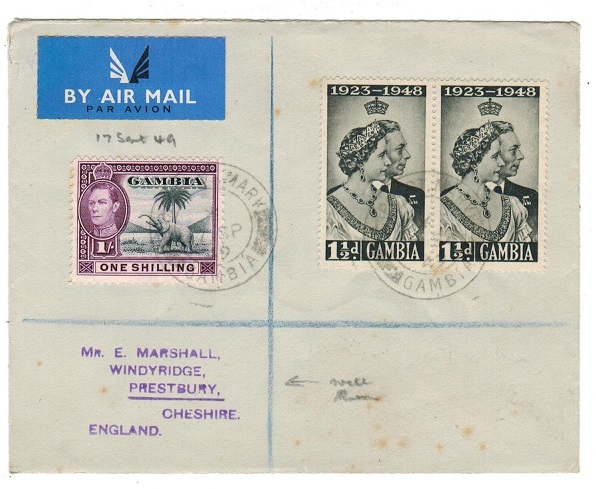 first flight cover addressed to Sierra Leone bearing 1/2d (x2), 1d and 1 1/2d adhesives tied BATHURST/GAMBIA cds with violet FIRST AIRMAIL/GAMBIA-SIERRA LEONE h/s. FREETOWN arrival b/s. 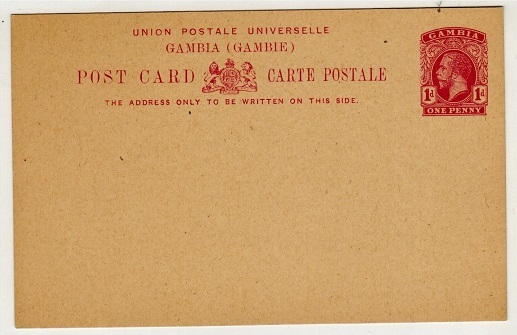 GAMBIA - 1941 1/3d rate PASSED BY CENSOR cover to UK used at FPO/109. 1941 (JY.4.) 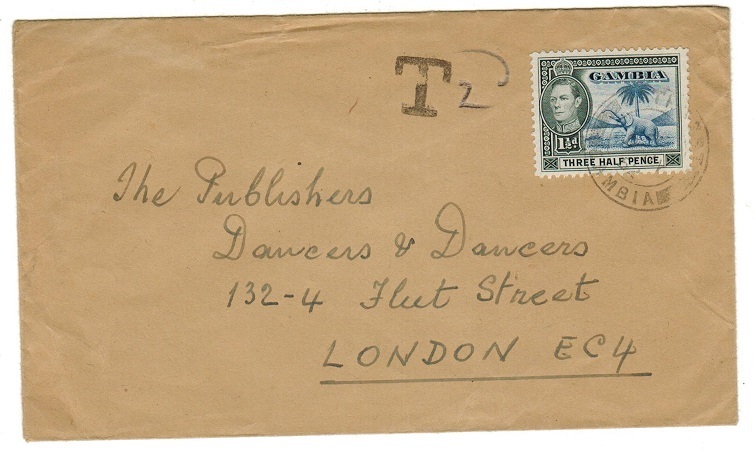 cover addressed to UK bearing 3d and 1/- adhesives tied by FIELD POST OFFICE/109 with violet crown triangular PASSED BY/CENSOR/No.2780 strike at lower left. 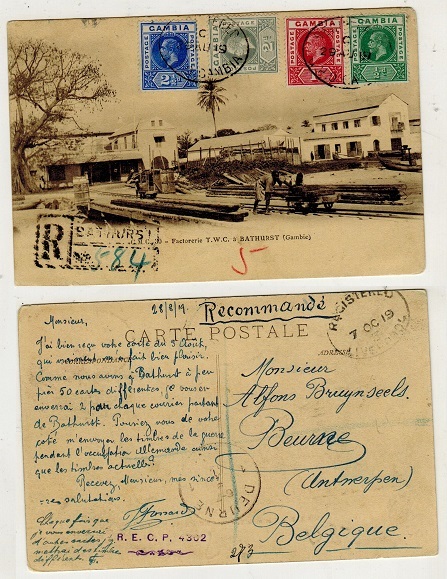 GAMBIA - 1921 1 1/2d rate postcard use to Switzerland used at MacCARTHY ISLAND. 1921 (FE.17.) 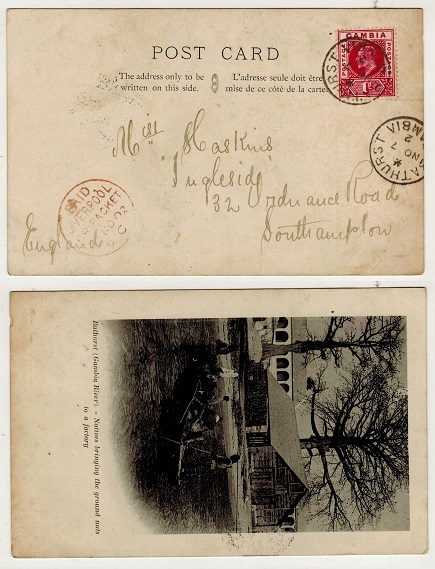 use of picture postcard addressed to Switzerland depicting 'Bathurst-Part of Wellington Street' bearing 1 1/2d adhesive tied to picture side by s/r MACARTHY ISLAND cds. BATHURST/GAMBIA transit b/s dated FE.18.21. An unusual use of the 1 1/2d adhesive and unusual with a Bathurst transit cds as in most cases they did not bother. 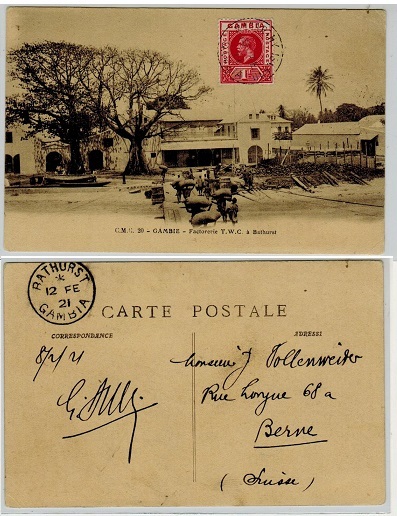 GAMBIA - 1921 1d rate postcard use to Switzerland used at MacCARTHY ISLAND. 1921 (FE.10.) 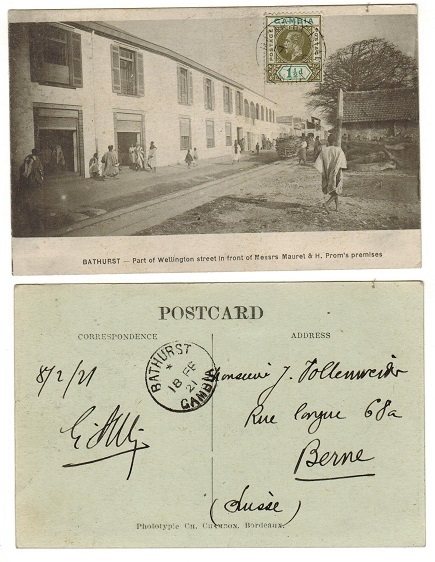 use of picture postcard addressed to Switzerland depicting 'Factorie T.W.C. Bathurst' bearing 'GV' 1d red adhesive on picture side tied by lovely neat MACARTHY ISLAND/GAMBIA cds. BATHURST transit b/s struck two days later. 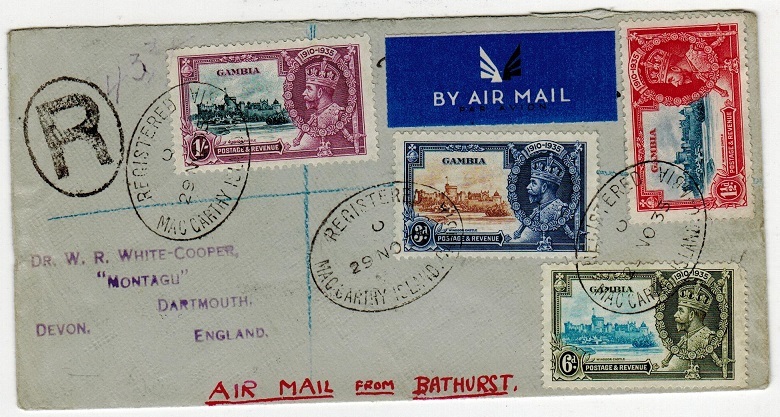 It is unusual to have transit marks from Bathurst on Gambian covers. 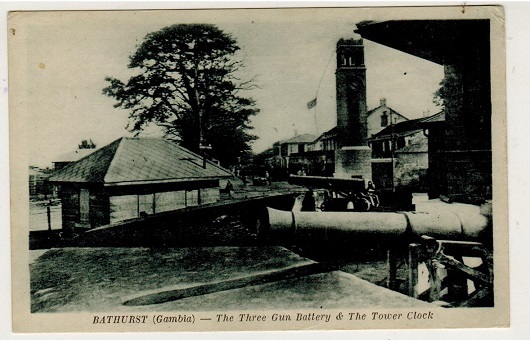 GAMBIA - 1910 (circa) unused postcard depicting The Three Gun Battery. 1910 circa greenish grey printed picture postcard in fine unused condition depicting 'The Three Gun Battery and Tower Clock at Bathurst'. 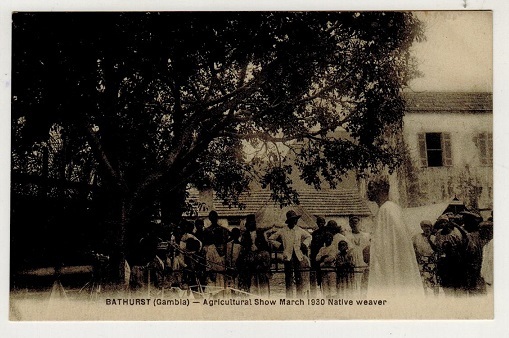 GAMBIA - 1930 (circa) unused postcard depicting Bathurst Agriculture Show. 1930 (circa) divided back picture postcard in fine unused condition depicting 'Bathurst - Agricultural Show March 1930-Native weaver'. GAMBIA - 1930 (circa) unused postcard depicting Christmas Feast. 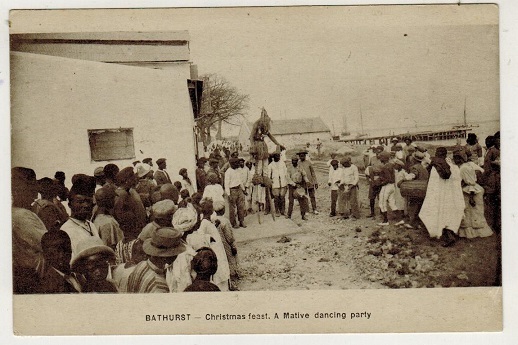 1930 (circa) divided back picture postcard in fine unused condition depicting 'Bathurst-Christmas Feast - A native dancing party'. 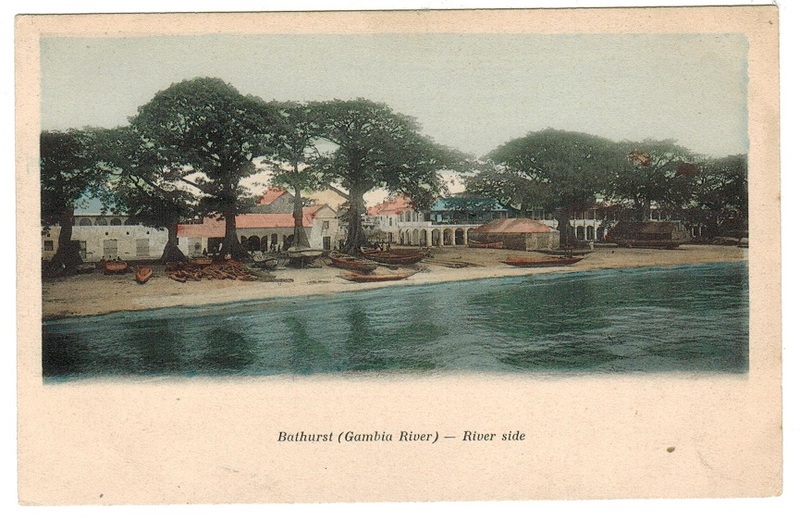 GAMBIA - 1902 1d rate postcard use to UK. 1902 (NO.7.) use of picture postcard addressed to UK depicting 'Natives Bringing The Ground Nuts to a Factory on the Gambia River' bearing Edward VII 1d adhesive tied BATHURST/GAMBIA with red circular PAID/LIVERPOOL/BR.PACKET cancel at left. 1902 (NO.7.) 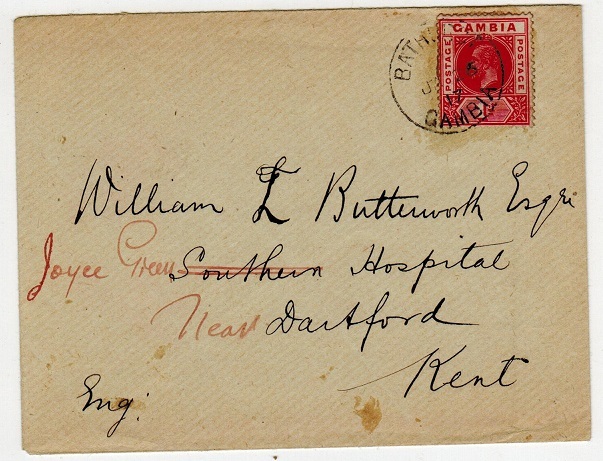 use of picture postcard addressed to UK depicting 'Government Place-Gambia' bearing Edward VII 1d adhesive tied BATHURST/GAMBIA with red circular PAID/LIVERPOOL/BR.PACKET cancel at left. GAMBIA - 1906 1/2d on 2/6d purple/brown fine mint with BROKEN E variety. SG 69. 1906 1/2d on 2s6d purple and brown/yellow in fine mint condition showing the variety BROKEN E in PENNY. Row 2/1. SG 69. (BK E40a). 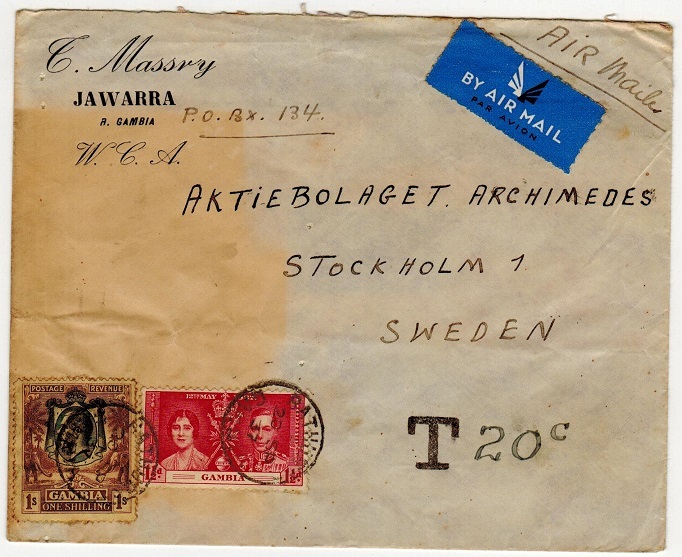 GAMBIA - 1937 cover to Sweden originating from Jawarra and underpaid. 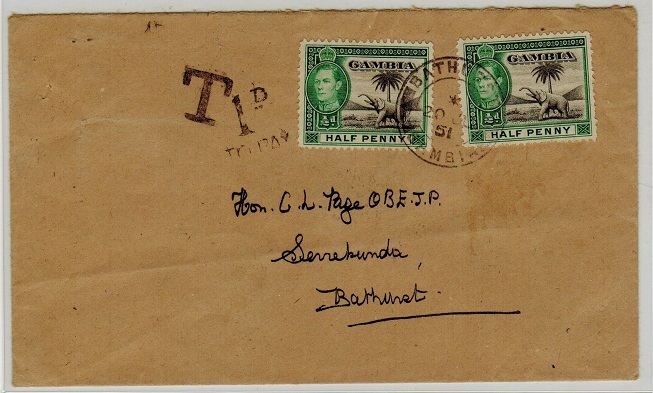 1937 commercial cover with pre printed 'E.Massry/Jawarra/R.Gambia' heading addressed to Sweden (scarce) with GV 1/- 'Elephant and Palm' and 1 1/2d 'Coronation' adhesive cancelled on arrival at BATHURST. The left hand side of the cover has an unfortunate discoloration on the front. The cover was deemed underpaid and has 'T' tax h/s applied with '20c' marked alongside in manuscript. Jawarra did not have a Post Office at this time and hence the stamps were cancelled on arrival at Bathurst. An exceedingly rare origin. 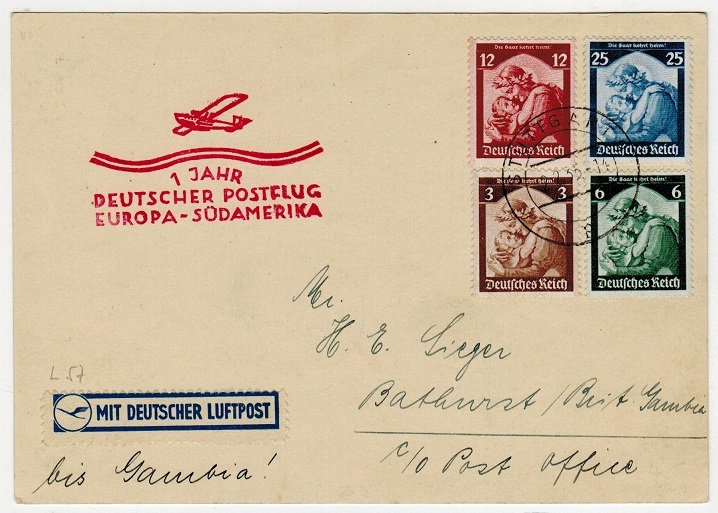 GAMBIA - 1935 inward Graf Zeppelin flight cover from Germany. 1935 (2.2.) inward card from Germany bearing 3pfg-25pfg series tied STRUTTGART and addressed to Mr Sieger at Bathurst Post Office. 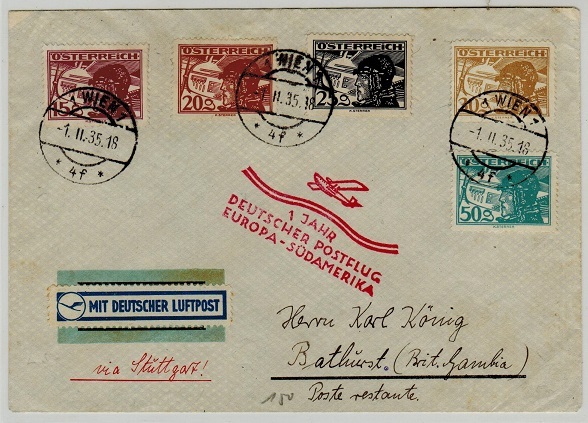 The card is struck by special red '1 Jahr, Deutscher Postflug, Europa-Sudamerika' cachet with blue on white MIT DEUTSCHER LUFTPOST label below. 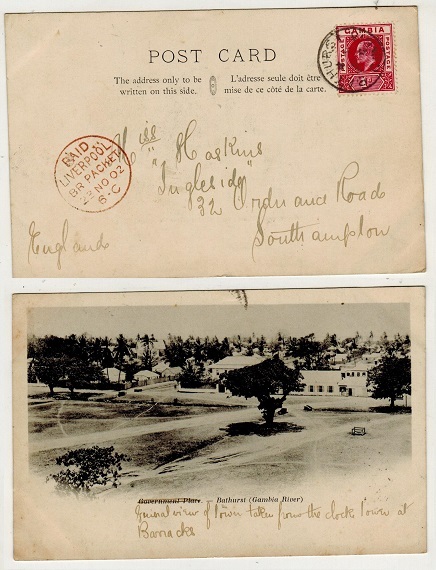 Back stamped by BATHURST/GAMBIA arrival cds dated 4.AP.35. A very rare acceptance flight by Deutsche Lufthansa Zeppelin mail flights sent through Gambia. GAMBIA - 1935 inward Graf Zeppelin flight cover from Austria. 1935 (1.11.) 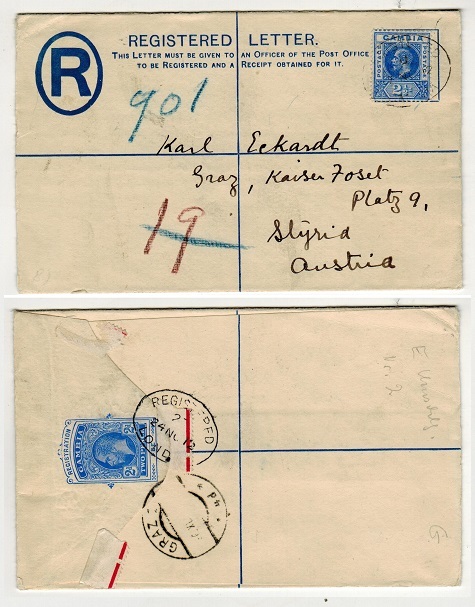 inward 'Graf Zeppelin' cover from Austria bearing various 'air' adhesives tied WIEN 1 with red '1 JAHR/DEUTCHER POSTFLUG/EUROPA-SUDAMERIKA handstamp applied on front and marked 'Via Stuttgart'. BATHURST/GAMBIA arrival b/s. German air services were ended in November 1934 due to an out break of yellow fever in Bathurst and the service was not resumed until a year later when Graf Zeppelin made three shuttle flights to Gambia. 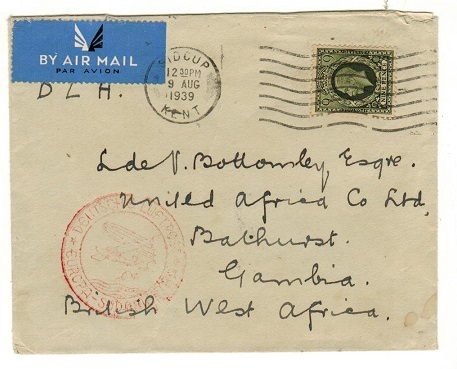 GAMBIA - 1938 inward Zeppelin post cover from UK via the experimental South American flight. 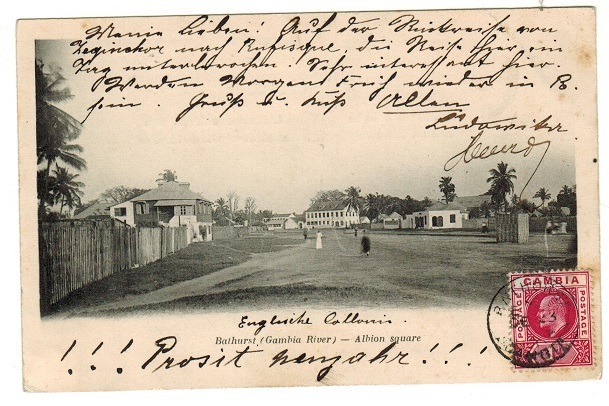 GAMBIA - 1919 registered use of postcard to Belgium. 1919 (AU.29.) registered use of picture postcard addressed to Belgium depicting 'Factorerie T.W.C. at Bathurst' and bearing 1/2d, 1d, 2d and 2 1/2d adhesives on the picture side cancelled by oval REGISTERED GPO/GAMBIA cancels. A scarce registered use of a postcard. GAMBIA - 1942 2/6d rate registered cover to UK used at T.P.O.No.2/GAMBIA. 1942 (MR.13.) 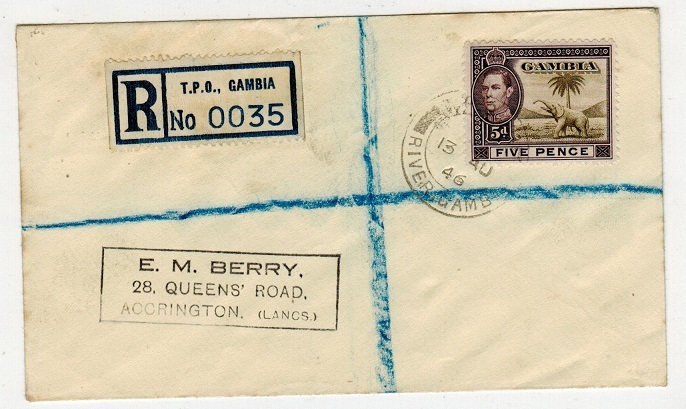 registered cover addressed to UK bearing 1/3d pair tied by T.P.O.No.2/RIVER GAMBIA cds with blue on white R/TPO. GAMBIA/No. registered label at left. GAMBIA - 1950 4d rate cover to UK used at GUNJUR. 1950 (AUG.11.) 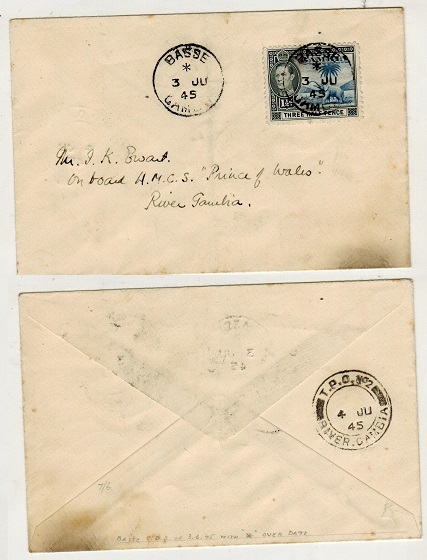 cover addressed to UK bearing 1d and 1 1/2d pair tied by scarce s/r GUNJUR/ GAMBIA cds's. GAMBIA - 1945 1 1/2d rate local cover to 'Prince Of Wales' on River Gambia from BASSE. 1945 (JU.3.) 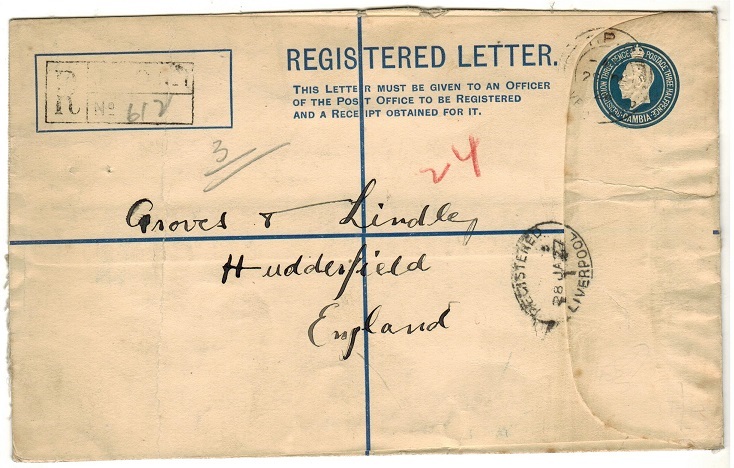 cover addressed locally to a passanger aboard 'H.M.C.S. 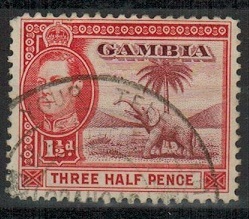 Prince Of Wales' on the River Gambia bearing 1 1/2d adhesive tied by BASSE/GAMBIA cds. TPO transit b/s. GAMBIA - 1955 1 1/2d rate local cover used at BASSE. 1955 (FE.10.) 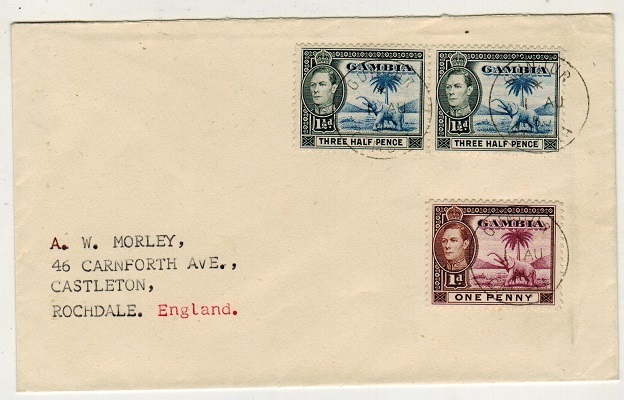 cover addressed locally and bearing 'KGVI' 1/2d strip of three tied by light BASSE/GAMBIA cds's. 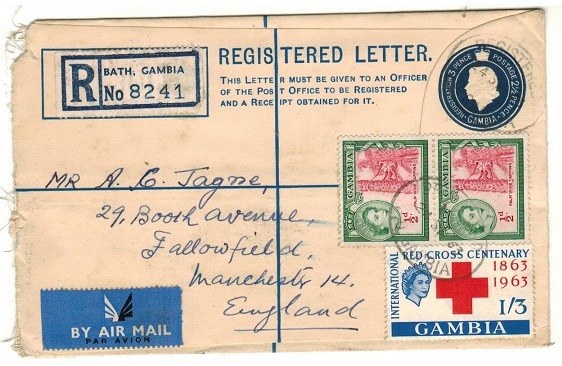 GAMBIA - 1942 'PASSED BY CENSOR' service cover to UK. 1942 (DE.6.) 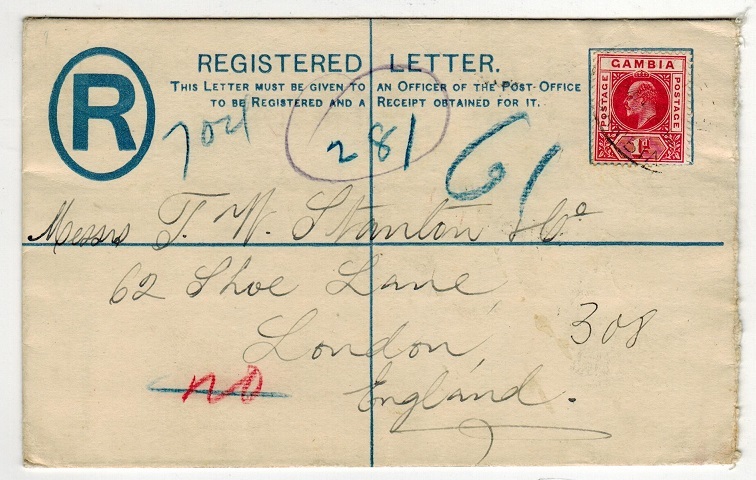 stampless cover addressed to UK cancelled by FIELD POST OFFICE/109 cds and struck at left by violet crowned circular PASSED BY CENSOR/No.3404 h/s. 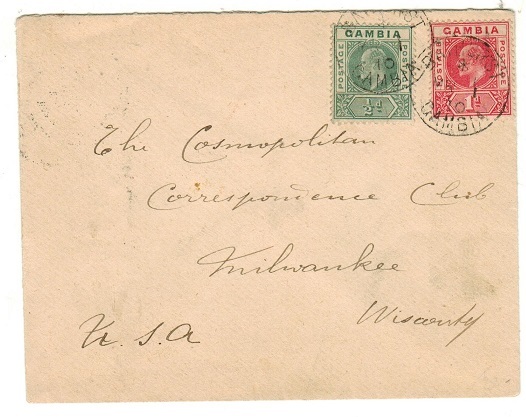 GAMBIA - 1910 1 1/2d rate cover to USA. 1910 (MR.1.) 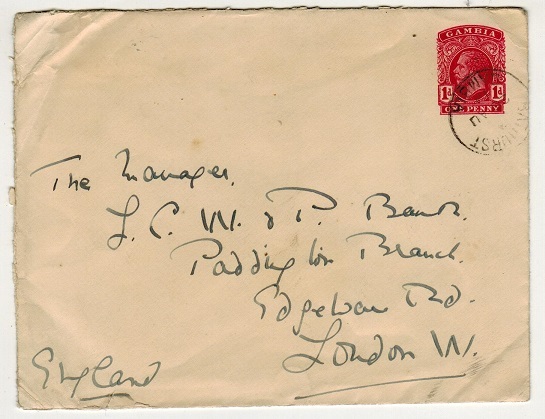 cover addressed to USA bearing Edward VII 1/2d and 1d adhesives tied BATHURST/ GAMBIA. GAMBIA - 1924 3d + 1 1/2d dark blue RPSE cancelled T.P.O./RIVER GAMBIA. H&G 5b. 1924 3d+1 1/2d dark blue on cream registered postal stationery envelope (size H) addressed to UK (fold at left side) cancelled by T.P.O./RIVER GAMBIA cds dated 29.DE.26 and with light but rare R/T.P.O.No.1/No. black rubber h/s at left. REGISTERED/LIVERPOOL arrival below. A very rare use of this stationery on the TPO river system. H&G 5b. GAMBIA - 1924 3d + 1 1/2d dark blue RPSE to UK used at BASSE/GAMBIA. H&G 5b. 1924 3d + 1 1/2d dark blue on cream registered postal stationery envelope (size H) addressed to UK cancelled by BASSE/GAMBIA cds dated 13.JA.28 with rare black boxed R/BASSE/No. registered h/s at left. (Opened on two sides and with wax seal removed from flap). REGISTERED/PLYMOUTH arrival. One of only three known registered uses from Basse. Exceedingly rare piece of stationery so used. H&G 5b. 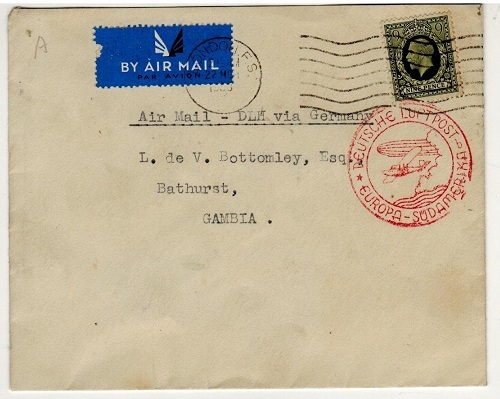 GAMBIA - 1937 inward 'Deutsch Luftpost' cover sent via the South American flight service. 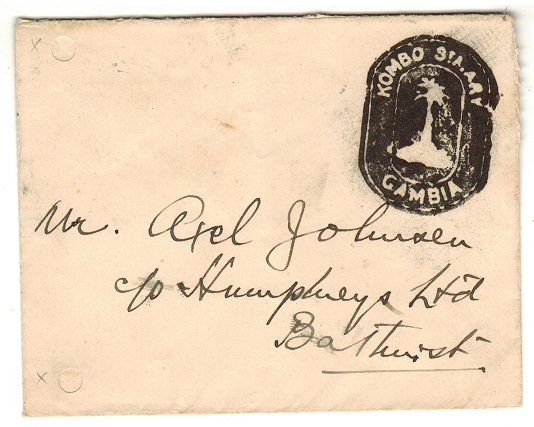 GAMBIA - 1930 (circa) 'KOMBO ST.MARY/GAMBIA' stampless local negative seal cover to Bathurst. 1930's circa stampless cover addressed locally to Bathurst and cancelled by a stunning negative seal type KOMBO ST.MARY/GAMBIA handstamp showing the national palm emblem in centre. (Two small file holes at left). Carried free and a superb a most unusual commercial cover. Kombo now part of Banjul. GAMBIA - 1935 'Silver Jubilee' set on cover to UK registered at MacCARTHY ISLAND. 1935 (NO.29.) 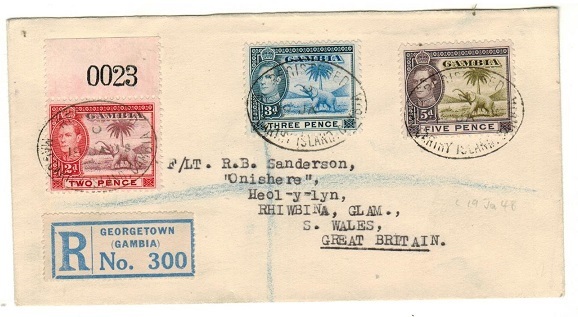 registered cover addressed to UK bearing the 'Silver Jubilee' set of four (SG 142-46) tied by scarce oval REGISTERED/MACARTHY ISLAND GAMBIA cancels with oval 'R' at left. Marked 'Air mail from Bathurst' in red manuscript. 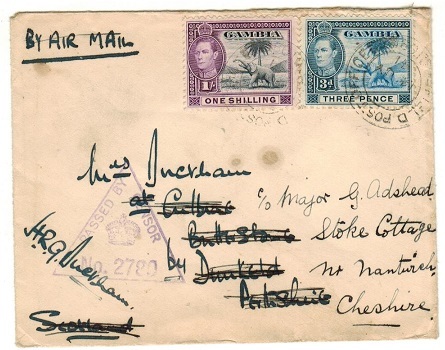 GAMBIA - 1948 6d rate 'INSUFFICIENTLY PREPAID FOR AIR MAIL' cover to UK. 1948 (13.AUG.) 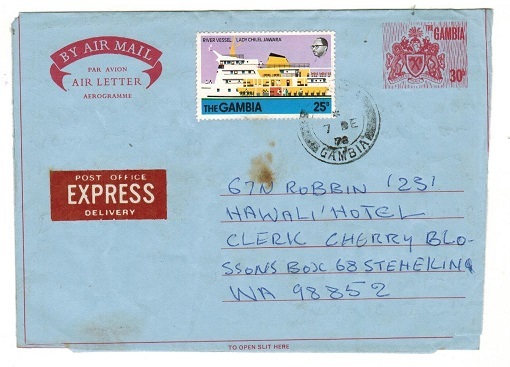 cover (a little tatty) addressed to UK and bearing 6d adhesive tied BATHURST/ GAMBIA and struck below by rare black boxed INSUFFICIENTLY PREPAID FOR/AIR MAIL TRANSMISSION. Proud type I24. GAMBIA - 1951 '1d TO PAY' taxed local cover. 1951 (JU.20) cover addressed locally to Serekunda bearing 1/2d adhesive (x2) tied BATHURST/ GAMBIA with scarce 'T' tax marking at left & rare '1d/TO PAY' h/s. (Proud UP12). 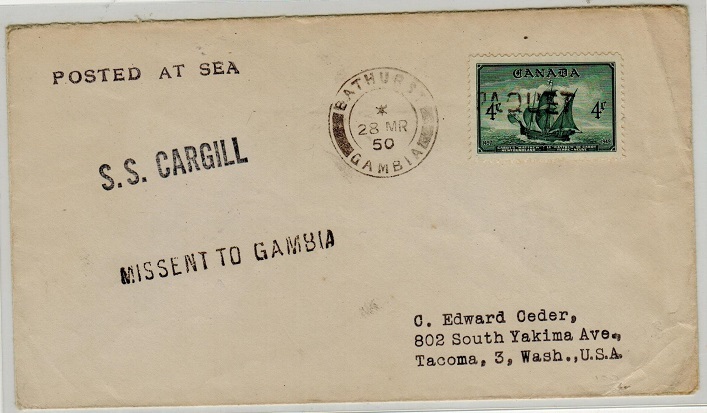 GAMBIA - 1950 'MISSENT TO GAMBIA' cover via 'S.S.CARGILL' maritime use to USA. 1950 (MR.28.) inward maritime cover from Canada (addressed to USA) bearing 4c adhesive tied PAQUEBOT with POSTED AT SEA h/s at left and S.S.CARGILL martime handstamp with BATHURST/ GAMBIA arrival cds and struck below by rare MISSENT TO GAMBIA instructional strike. Forwarded onwards and with WASHINGTON D.C.MISSENT arrival b/s dated MAY.10.50. GAMBIA - 1956 'M.V.SWEDKU' maritime cover to USA. 1956 (JU.4.) cover addressed to USA bearing 'GB' KGVI 1/2d and 1d adhesives tied by s/l PAQUEBOT handstamp with BATHURST/GAMBIA cds alongside. Struck at left by violet M.V.SWEDKU/182443/LIVERPOOL maritime strike. 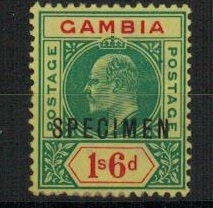 GAMBIA - 1912 1d PSE to UK used at BATHURST. H&G 2a. 1912 1d rose on cream postal stationery envelope (size b) addressed to UK (opened on 2 sides) cancelled by BATHURST/GAMBIA cds dated 28.AU.19. H&G 2a. 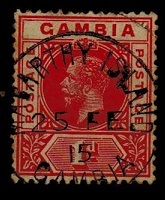 GAMBIA - 1912 1d PSE to UK used at BATHURST. H&G 2. 1912 1d rose on cream postal stationery envelope (size a) addressed to UK cancelled by BATHURST/GAMBIA cds dated 29.JA.23. H&G 2. GAMBIA - 1922 1 1/2d bright rose scarlet cancelled JAWARRA/GAMBIA. Very scarce. SG 125. 1922 1 1/2d bright rose scarlet 'Elephant and Palm' issue (SG 125) cancelled by large part JAWARRA/ GAMBIA cds dated 25.FE.33. (Proud type D2). Exceedingly rare. GAMBIA - 1901 multi franked 'QV' key plate cover registered to UK. 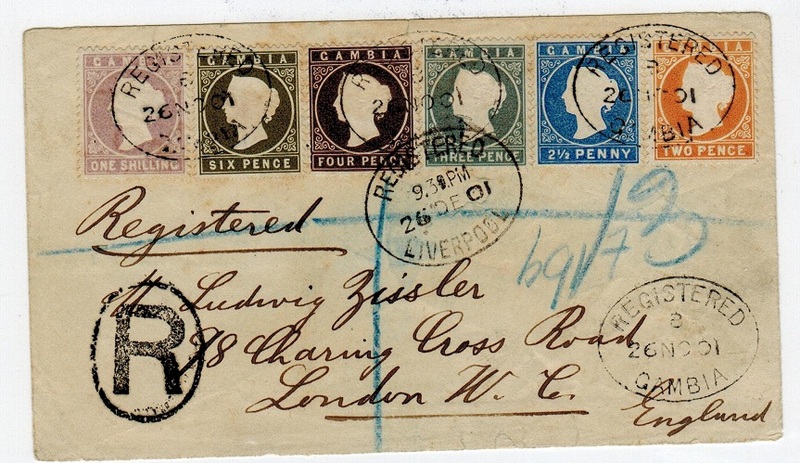 1901 (JLY.19) registered cover to UK bearing the 'QV' key plate 2d, 2 1/2d, 3d, 4d, 6d & 1/- adhesives (SG 39-44) tied by various oval REGISTERED/GAMBIA cancels. GAMBIA - 1902 2d ultramarine RPSE (size F) uprated to Germany. H&G 1. 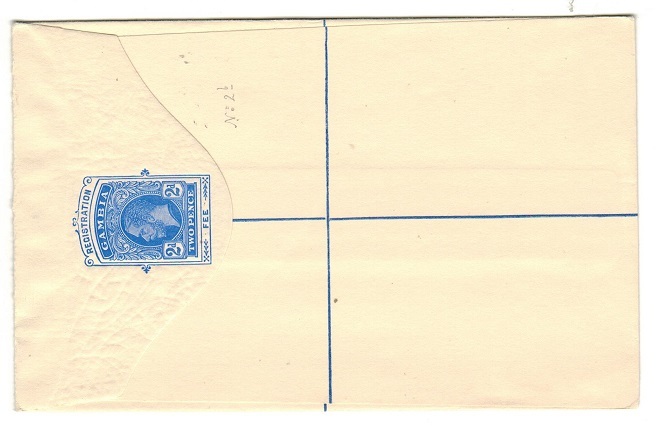 1902 2d ultramarine on cream registered postal stationery envelope (size F) addressed to Germany bearing additional 1/2d and 1d (x2) tied by oval REGISTERED/GPO GAMBIA cancels dated OC.21.03. H&G 1. GAMBIA - 1902 2d ultramarine RPSE (size G) unused. H&G 1a. 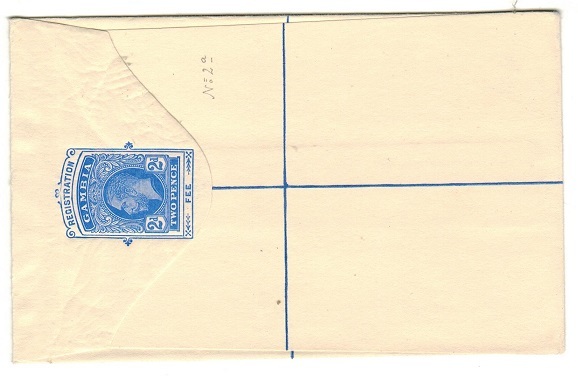 1902 2d ultramarine registered postal stationery envelope (size G) in fine unused condition. H&G 1a. GAMBIA - 1902 2d ultramarine RPSE (size F) unused. H&G 1. 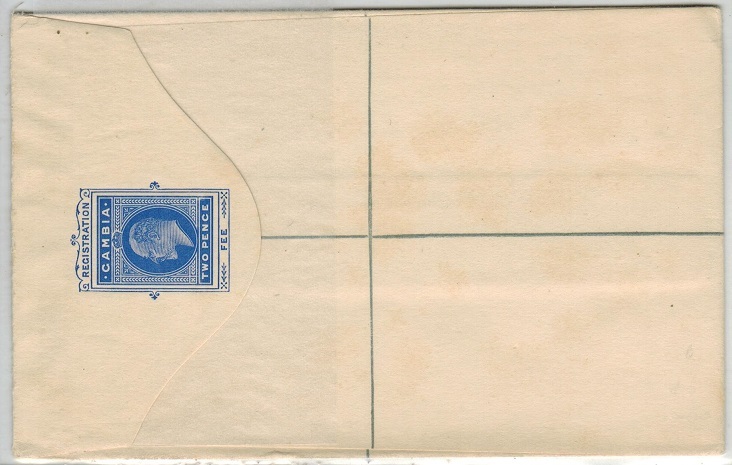 1902 2d ultramarine registered postal stationery envelope (size F) in fine unused condition. H&G 1. GAMBIA - 1912 2d ultramarine RPSE (size G) to UK uprated with 1d adhesive. H&G 2a. 1912 2d ultramarine on creamy white registered postal stationery envelope (size G) addressed to UK & bearing additional 1d adhesive tied by oval REGISTERED/G.P.O.GAMBIA cancel dated 4.OC.20. H&G 2a. GAMBIA - 1912 2d ultramarine RPSE (size G) to Austria uprated with 2 1/2d adhesive. H&G 2a. 1912 2d ultramarine on cream registered postal stationery envelope (size G) addressed to Austria bearing additional 2 1/2d adhesive tied by REGISTERED/GPO GAMBIA cancel dated 7.NO.12. A nice early use of this stationery. H&G 2a. GAMBIA - 1912 2d ultramarine RPSE (size G) unused. H&G 2a. 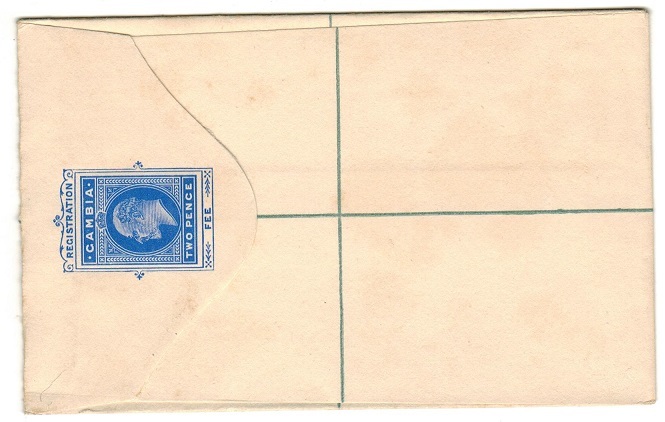 1912 2d ultramarine registered postal stationery envelope (size G) in fine unused condition. H&G 2a. GAMBIA - 1912 2d ultramarine RPSE (size F) unused. H&G 2. 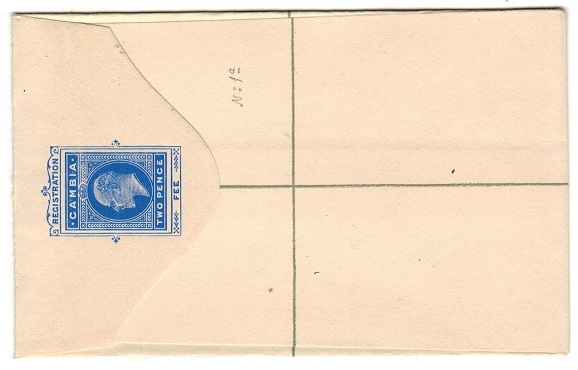 1912 2d ultramarine registered postal stationery envelope (size F) in fine unused condition. H&G 2. 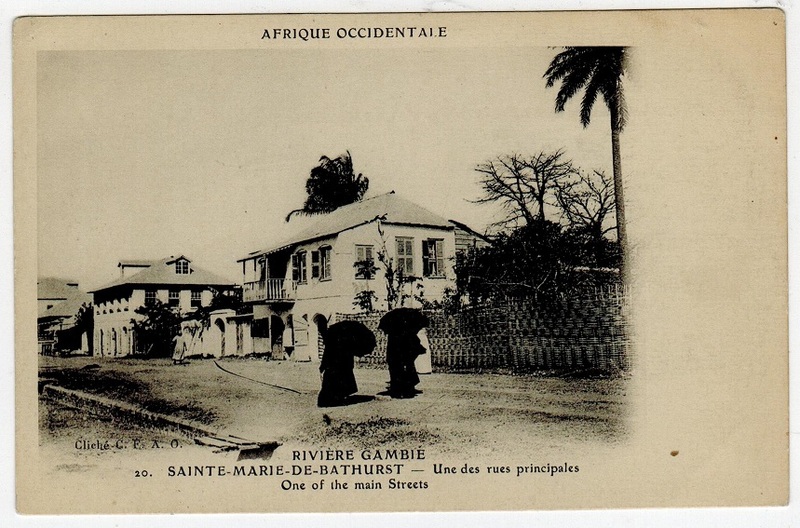 GAMBIA - 1909 1d rate postcard use to France used at BATHURST. 1909 (DE.9.) 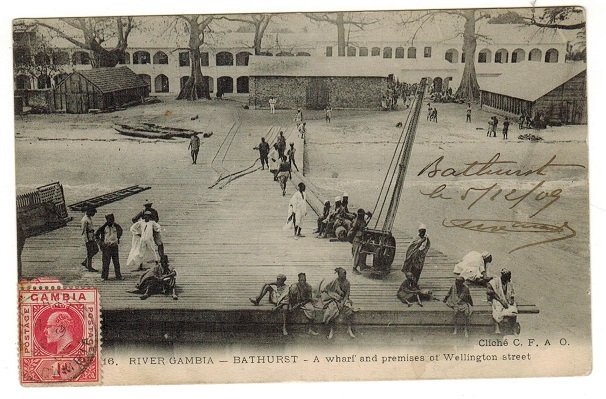 use of picture postcard addressed to France depicting 'Wharf and premises of Wellington Street at Bathurst' bearing Edw 1d on picture side cancelled BATHURST/GAMBIA. GAMBIA - 1908 1d rate postcard use to France used at BATHURST. 1908 (DE.29.) 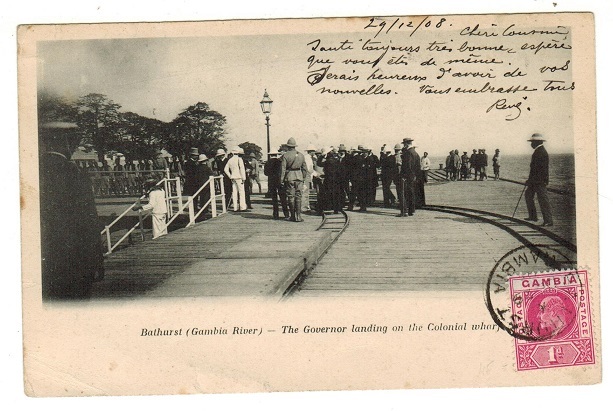 use of picture postcard addressed to France depicting 'Bathurst-The Governor Landing at the Colonial Wharf' bearing Edward VII 1d adhesive tied to picture side by BATHURST/GAMBIA cds. A nice card. GAMBIA - 1904 1d rate postcard use to Germany used at BATHURST. 1904 (DE.23.) 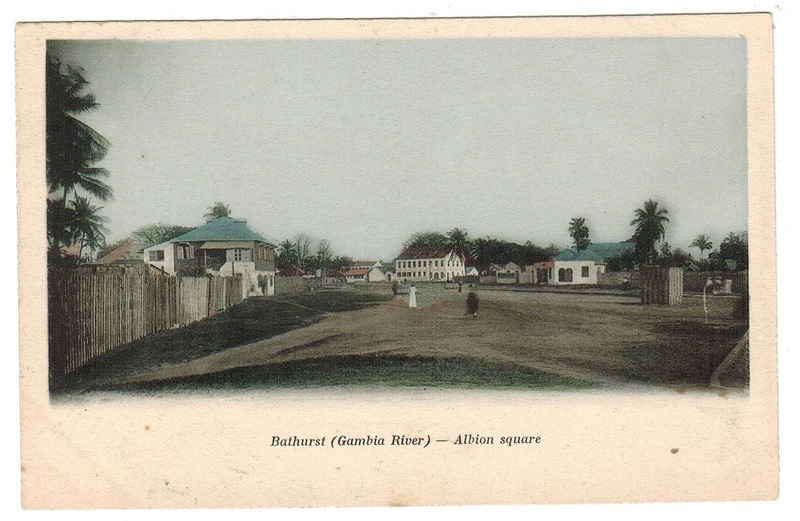 use of picture postcard addressed to Germany (genuine use) depicting 'Bathurst- Albion Square' and bearing 1d adhesive tied to the picture side by BATHURST/GAMBIA cds. 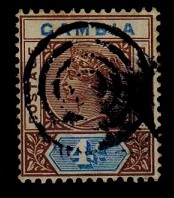 GAMBIA - 1898 4d brown and blue cancelled by 'concentric' circle cancel. SG 42. 1898 4d brown and blue 'key plate' adhesive tied by the scarce concentric ringed cancel. SG 42. GAMBIA - 1941 1/3d rate TPO/No.2 censored cover to UK (faults). 1941 (SP.14.) 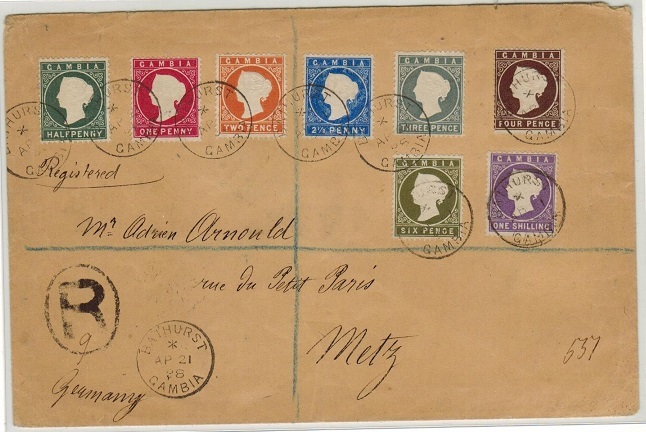 cover addressed to UK (some staining) bearing 3d and 1/- adhesives tied by T.P.O.No.2/RIVER GAMBIA cds's and struck by scarce violet boxed PASSED BY CENSOR/BATHURST handstamp.Large piece of paper adherence on reverse side. Faults but a nice censored origin at the TPO. 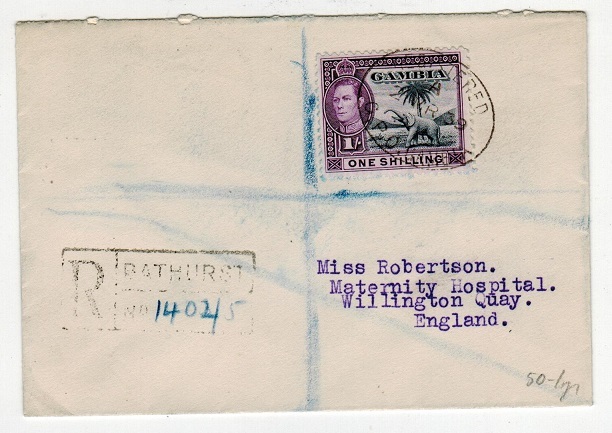 GAMBIA - 1941 green cross 'ACTIVE SERVICE' censored cover to UK used at FPO/109. 1941 (DE.23.) use of green on buff ACTIVE SERVICE green cross envelope addressed to UK cancelled FIELD POST OFFICE/109 cds and struck at left by violet triangular PASSED BY/CENSOR/ No.2789 crowned handstamp. The majority of the censor label at left torn away from rough opening. 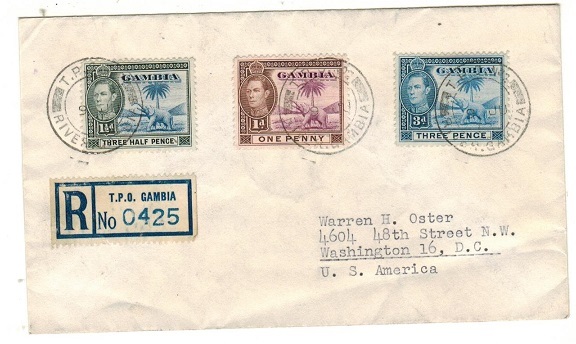 GAMBIA - 1940 1/2d rate censored cover to USAS used at BATHURST. 1940 (MY.30.) 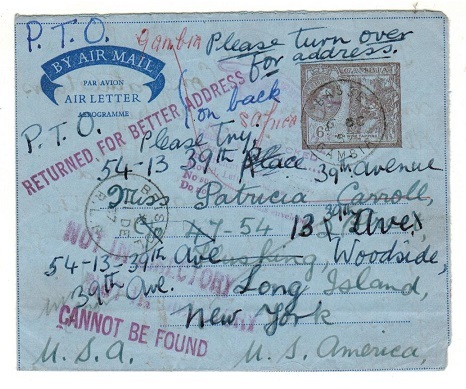 long cover addressed to USA bearing 1 1/2d adhesive tied by BATHURST/GAMBIA cds and with black on white P.C.90/OPENED BY/EXAMINER 5416 label at left. GAMBIA - 1941 'OAS' FPO/106 censor cover to UK. 1941 (SP.22.) 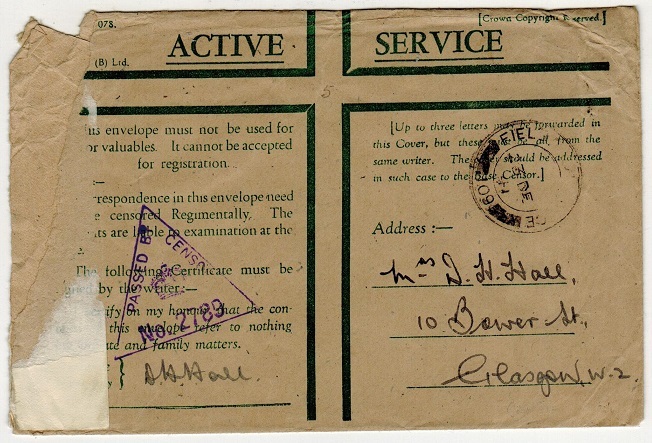 'On Active Service' cover addressed to UK bearing 'GB' 1d adhesive tioed by FIELD POST OFFICE/109 cds with light violet crowned triangular PASSED BY/CENSOR/No.2170 handstamp at left. WASC type A200. This censor mark only recorded on this day. 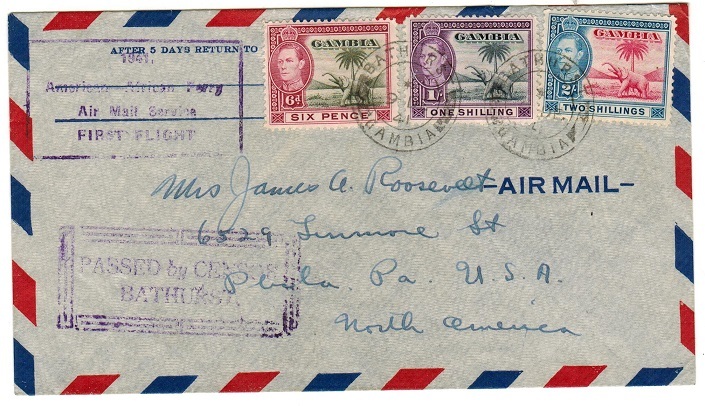 GAMBIA - 1941 censored first flight cover to USA. 1941 (DE.9.) 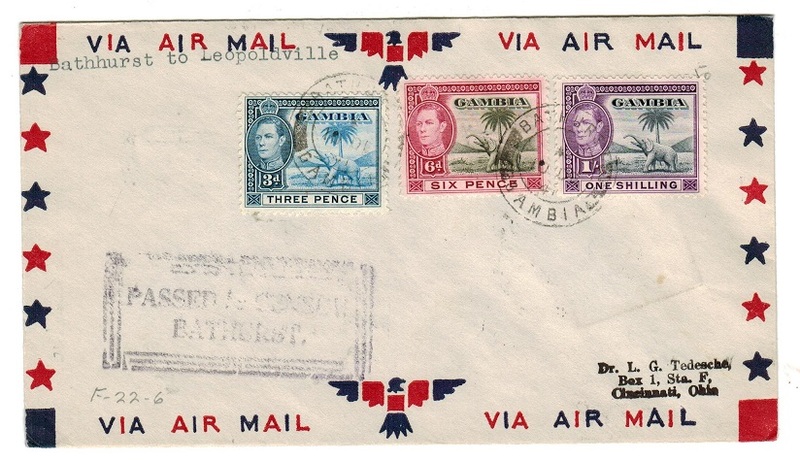 first flight cover addressed to USA bearing 6d, 1/- and 2/- adhesives tied BATHURST/ GAMBIA with violet boxed 1941/AMERICAN-AFRICAN FERRY/AIR MAIL SERVICE/FIRST FLIGHT cachet at left and struck by scarce violet boxed PASSED BY CENSOR/BATHURST h/s. WASC type 2. An unusual censorship of this flight cover. 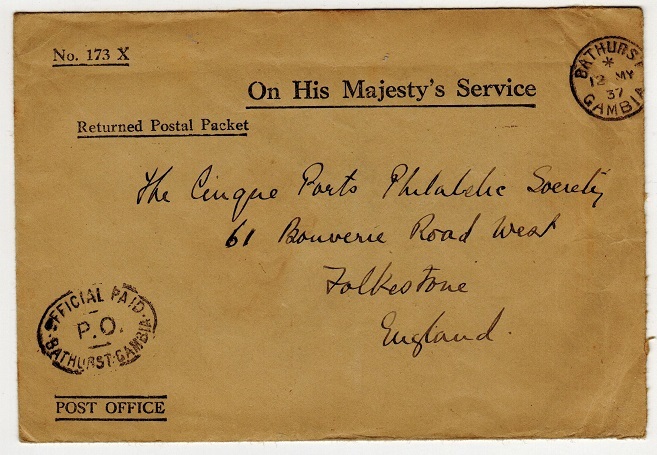 GAMBIA - 1937 OFFICIAL PAID/BATHURST 'OHMS' RETURNED POSTAL PACKET envelope to UK. 1937 (MY.12.) 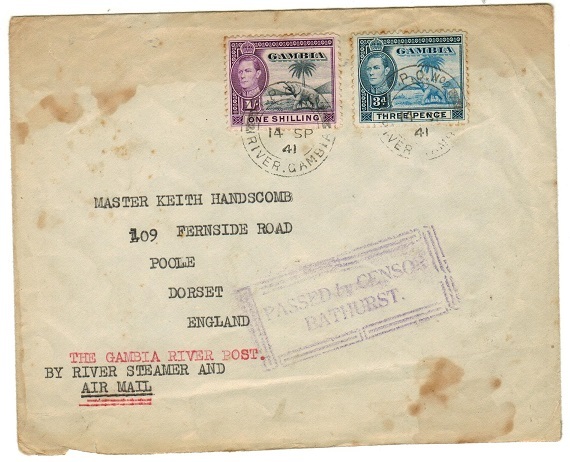 use of manilla (No.173 X) ON HIS MAJESTYS SERVICE/RETURNED POSTAL PACKET envelope addressed to UK cancelled by BATHURST/GAMBIA cds and struck by scarce oval OFFICIAL PAID/P.O./BATHURST GAMBIA handstamp in black at lower left. A scarce piece of official stationery. GAMBIA - 1935 'Silver Jubilee' set on four individual first day covers to Canada. 1935 (MY.6.) 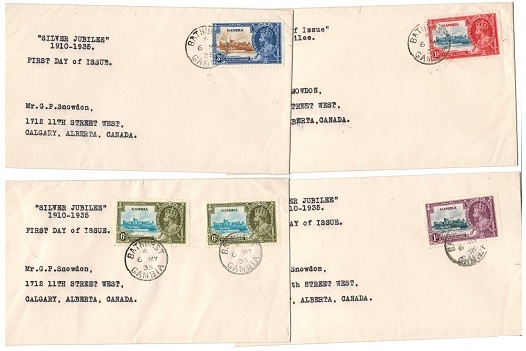 range of four covers each bearing one of the values of the 1935 'Silver Jubilee' series (SG 143-146) ised at BATHURST on the first day of issue. The 6d cover having two eaxamples applied. (4 covers). 1938 (JU.24.) 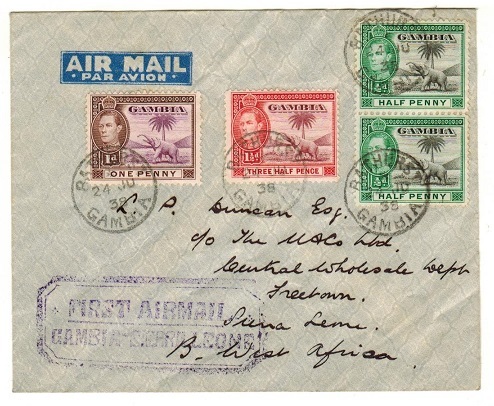 first flight cover addressed to Sierra Leone (light central fold) bearing 1/2d and 3d adhesives tied BATHURST/GAMBIA with violet boxed FIRST AIRMAIL/GAMBIA-SIERRA LEONE h/s applied. FREETOWN and CLINE TOWN arrival b/s's. GAMBIA - 1912 2 1/2d rate cover to USA. 1912 (JY.5.) 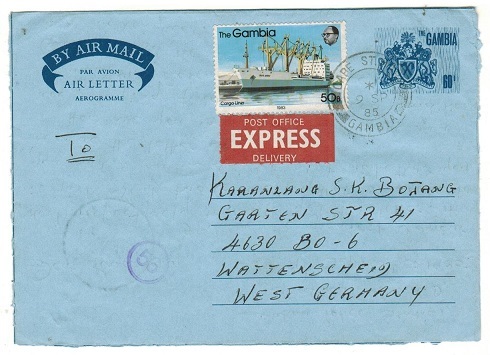 cover addressed to USA bearing 2 1/2d adhesive tied by BATHURST/GAMBIA cds. LIVERPOOL transit b/s. GAMBIA - 1960 (circa) 'FORMULA' RPSE unused. 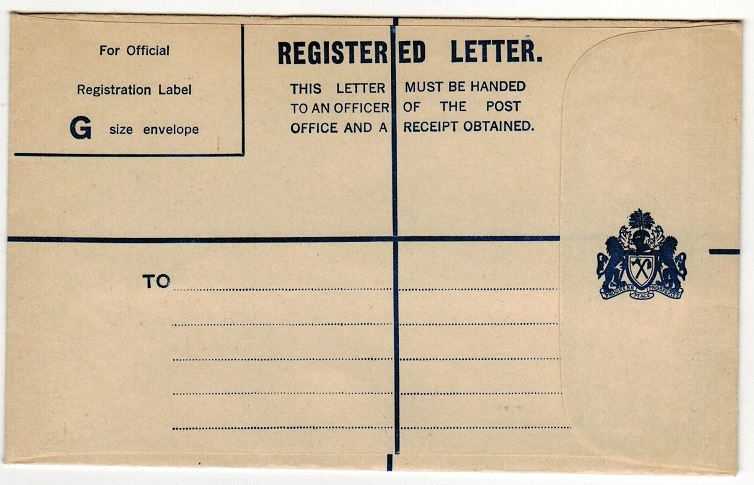 1960 (circa) blue on cream FORMULA registered postal stationery envelope (size G) with blue cresting on flap. Not seen before and unusual item. 1902 2d ultramarine on cream registered postal stationery envelope (size G) in unused condition lightly affected by age spots. H&G 1a. 1902 2d ultramarine on cream registered postal stationery envelope (size F) in unused condition with small adherence under flap edge due to gum and lightly affected by age spots. H&G 1. GAMBIA - 1949 registered cover to UK used at CAPE ST MARY. 1949 (SP.17.) registered cover to UK (few odd tone spots at bottom) bearing KGVI 1/- tied with 'Wedding' 1 1/2d pair by CAPE ST MARY/GAMBIA cds's. GAMBIA - 1924 1 1/2d rose PSE unused SPECIMEN. H&G 3. 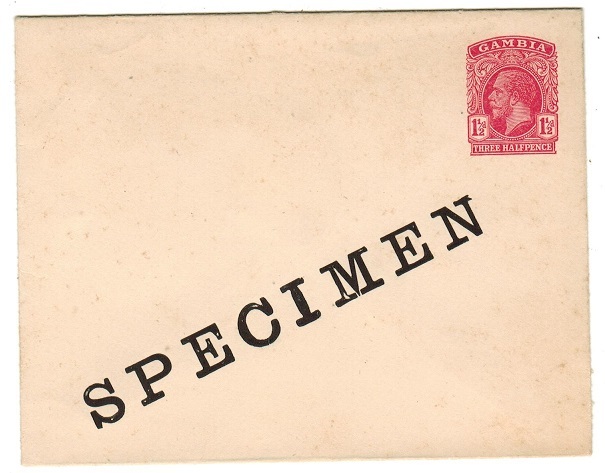 1924 1 1/2d Rose on white postal stationery envelope (very lightly aged) in fine unused condition (type a) with diagonal SPECIMEN h/s. H&G 3. 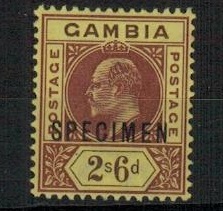 GAMBIA - 1924 3d+ 1 1/2d RPSE (size G) SPECIMEN. H&G 5a. 1924 3d + 1 1/2d Dark blue on cream registered postal stationery envelope (size G) in fine unused condition with diagonal SPECIMEN h/s on reverse. H&G 5a. 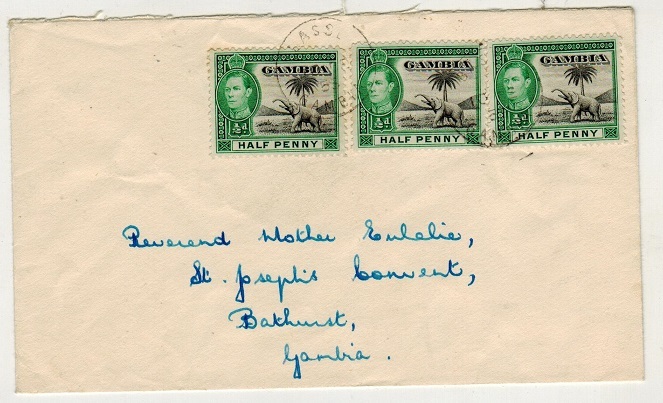 GAMBIA - 1940 KGVI 1 1/2d adhesive use with BATHURST GAMBIA SEND YOUR TELEGRAMS VIA IMPERIAL cds. 1940 use of 'KGVI' 1 1/2d cancelled by a part strike of the scarce BATHURST GAMBIA SEND YOUR TELEGRAMS VIA IMPERIAL treble ringed cancel. (Andrews type 4). This strike was only in use from August to November in 1940 and is a most elusive strike on stamp. 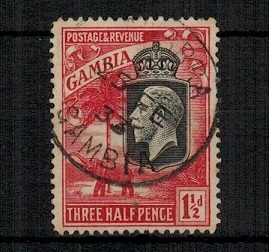 GAMBIA - 1924 3d+1 1/2d RPSE to UK used at BATHURST. H&G 5a. 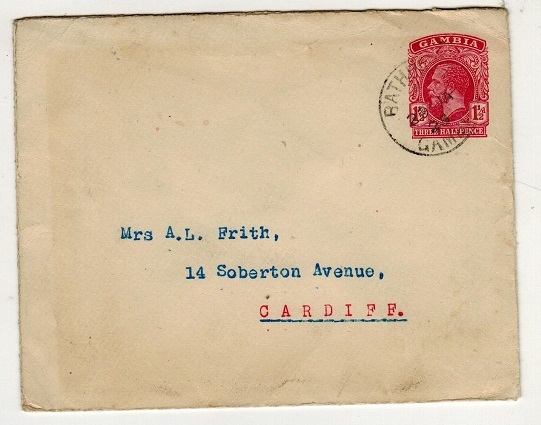 1924 3d + 1 1/2d dark blue on cream registered postal stationery envelope (size G) to UK & lightly cancelled by oval REGISTERED/GPO GAMBIA cancel dated 11.JA.24 with similar b/s. H&G 5a. GAMBIA - 1952 local 1 1/2d rate cover used at BASSE. 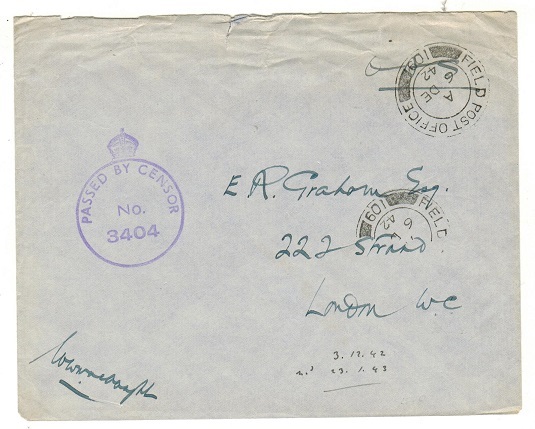 1952 (FE.4) cover addressed locally to the 'St.Joseph's Convent' bearing 'KGVI' 1 1/2d adhesive (SG 152c) tied by s/r BASSE cds. 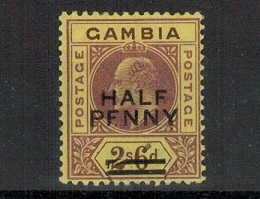 GAMBIA - 1952 underpaid tax cover to UK used at BATHURST. 1952 (JUN.9.) 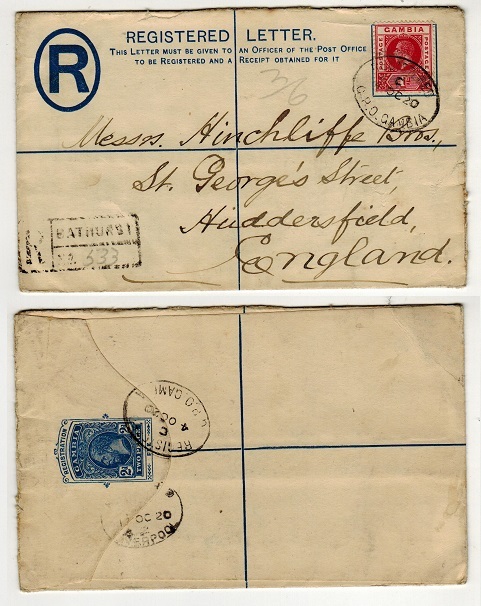 cover addressed to UK bearing 1 1/2d adhesive tied BATHURST/GAMBIA and being under paid having 'T' tax mark applied at left with '2d' inserted in manuscript. 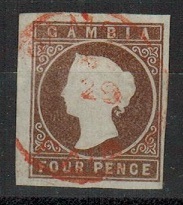 GAMBIA - 1874 4d pale brown 'Cameo' used with four wide margins. SG 6. 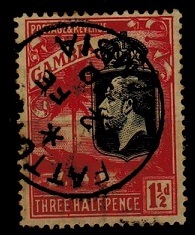 1874 4d pale brown 'Cameo' adhesive with four fine margins cancelled by light red GAMBIA/PAID cds. SG 6. 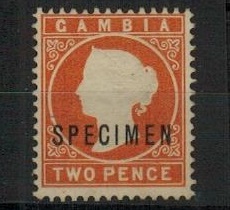 GAMBIA - 1902 2d RPSE to UK uprated with additional 1d adhesive. H&G 1a. 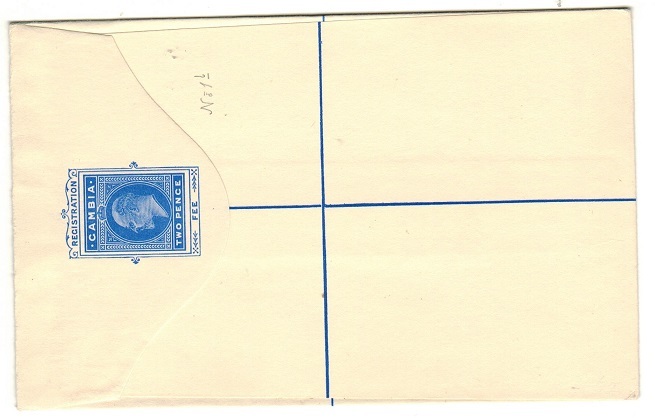 1902 2d ultramarine on white registered postal stationery envelope (size G) addressed to UK bearing additional 1d adhesive tied by oval REGISTERED/GPO GAMBIA cancel. H&G 1a. GAMBIA - 1922 1 1/2d (SG 125) struck by scarce FATTOTO/GAMBIA cds. 1922-29 1 1/2d bright rose-scarlet 'elephant and palm' adhesive (SG 125) cancelled by near complete FATTOTO/GAMBIA cds dated 2.FE.30. A scarce village cancel. 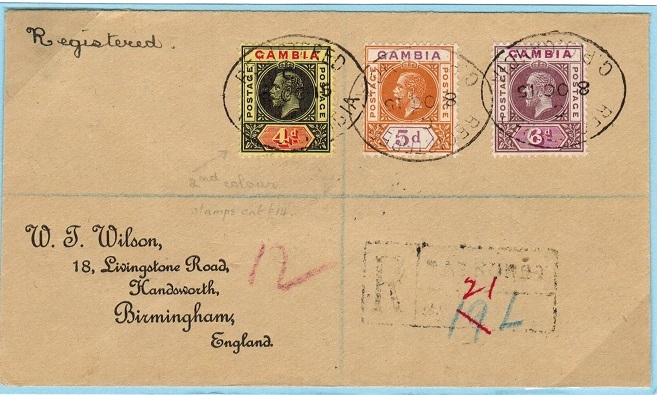 GAMBIA - 1937 'OHMS' envelope use to UK. 1937 (AP.9.) 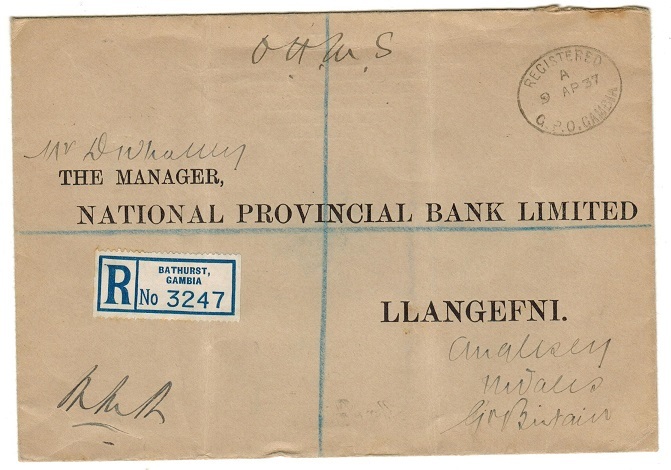 registered unstamped commercial cover to the National Provincial Bank in UK marked 'O.H.M.S.' in manuscript and cancelled by oval REGISTERED/GPO GAMBIA cancel. GAMBIA - 1951 registered cover to UK used at KUNTUR-UR. 1951 (NO.11.) registered cover addressed to UK bearing 1/2d, 1d, 1 1/2d, 2d and 1/3d adhesives tied by s/r KUNTA-UR cds with R/KUNTAUR/(GAMBIA)/No. registered label at left. 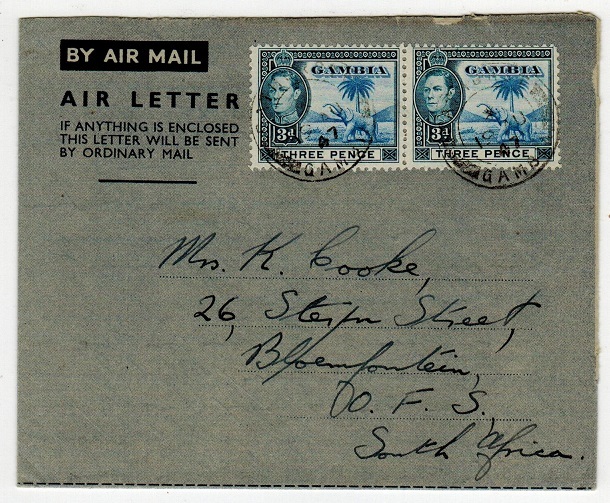 GAMBIA - 1947 6d rate use of FORMULA air letter to Bloemfontein from BATHURST. 1947 (AU.19.) use of blue on grey FORMULA air letter addressed to Bloemfontein in South Africa and bearing a KGVI 3d adhesive pair tied by BATHURST/GAMBIA cds. A nice use. GAMBIA - 1946 5d rate registered cover to UK used at TPO RIVER GAMBIA. 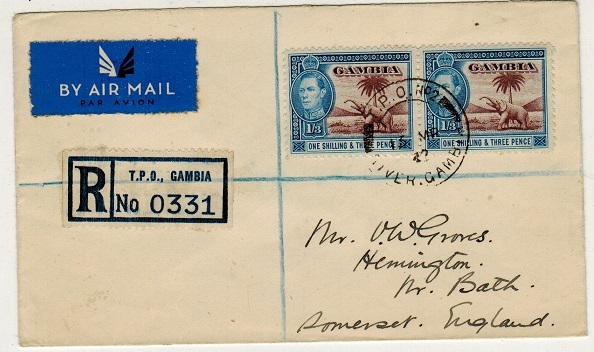 1946 (AU.13) registered cover to UK bearing 5d (SG 154a) tied by TPO/RIVER GAMBIA cds with blue on white TPO., GAMBIA registered etiquette at left. 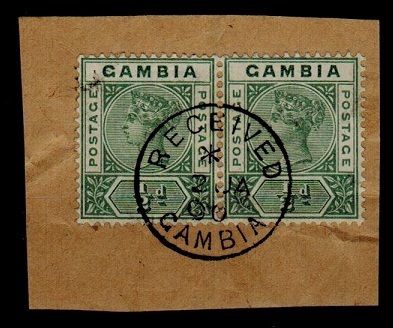 GAMBIA - 1917 1d rate cover to UK. 1917 (JA.26.) 1d rate cover addressed to UK cancelled by BATHURST/GAMBIA cds. 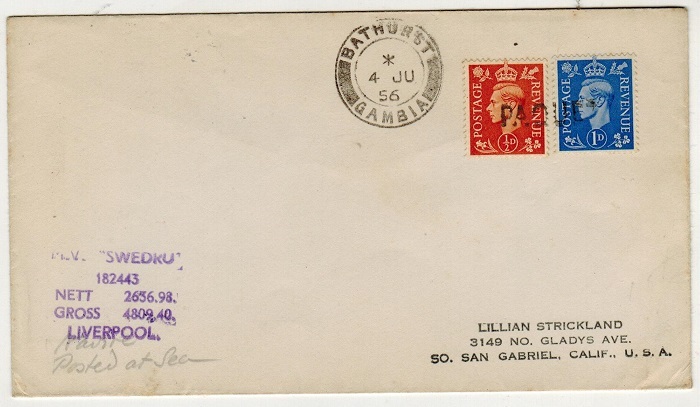 GAMBIA - 1939 1/- rate registered cover to UK used at BATHURST. 1939 (MR.2.) 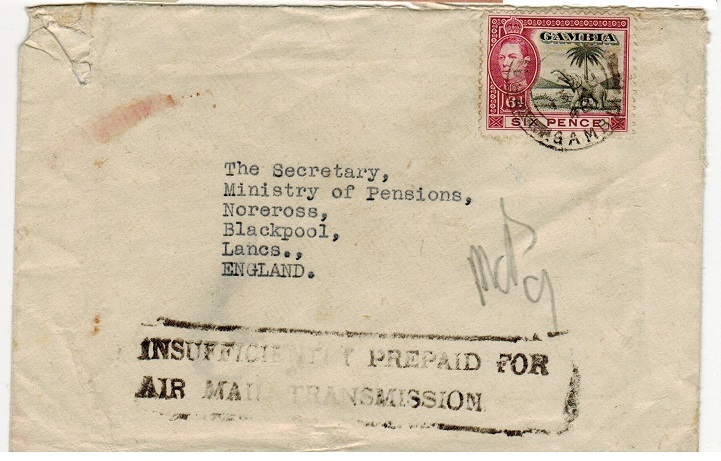 registered cover addressed to UK bearing 1/- adhesive tied by REGISTERED/GPO GAMBIA cancel with R/BATHURST/No. rubber boxed registered h/s at left. GAMBIA - 1912 1d red struck by central MACARTHY ISLAND cds dated 25.FE.15. 1912-22 1d red adhesive cancelled by superb central MACARTHY ISLAND/GAMBIA cds dated 25.FE.15. without coding. 1900 (JA.2.) use of a fine pair of the 1/2d green 'Key Plate' adhesives (SG 37) tied to manilla piece by complete RECEIVED/GAMBIA cds with star coding. GAMBIA - 1941 'American Ferry' cover to USA with PASSED BY CENSOR h/s applied. 1941 (DE.10.) 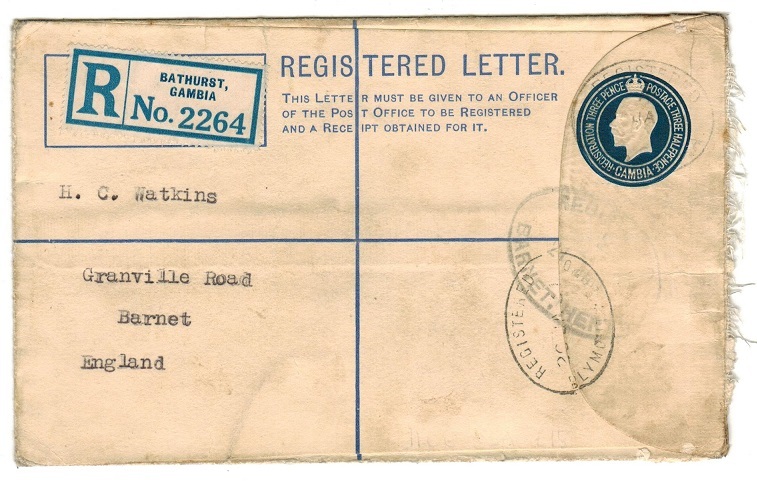 airmail cover to USA bearing 3d,6d and 1/- adhesives tied BATHURST with black boxed PASSED BY CENSOR/BATHURST h/s applied below. 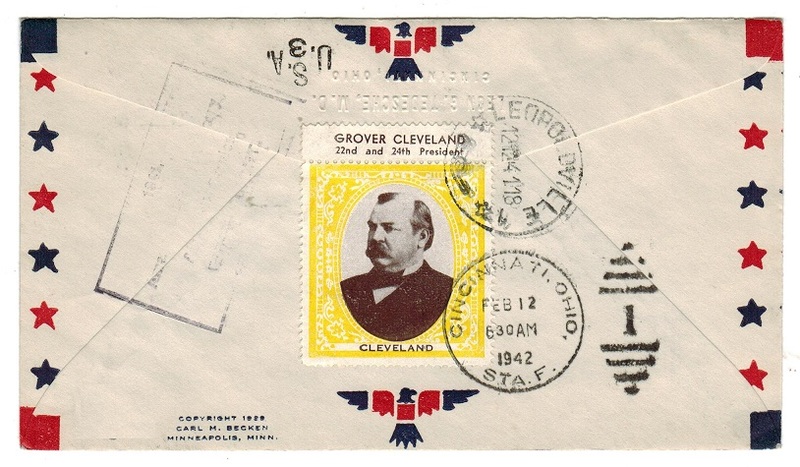 'Grover Cleveland' yellow and brown on white perforated US label on reverse tied on arrival. 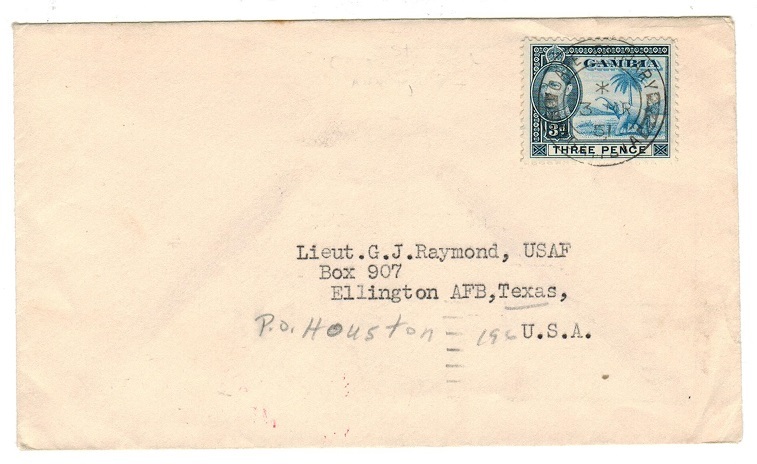 Sent by 1941/AMERICAN- AFRICAN FERRY/AIR MAIL SERVICE/FIRST FLIGHT cacheted thus on reverse. A scarce censored use on this flight. 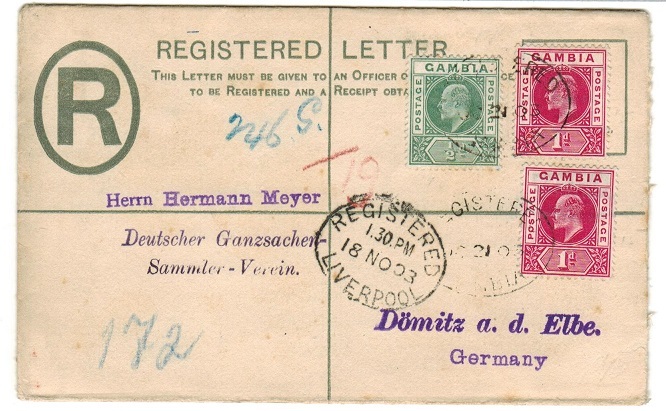 GAMBIA - 1915 4d, 5d and 6d on registered cover to UK. 1915 (OC.8.) registered (Wilson) cover addressed to UK bearing 4d, 5d and 6d adhesives tied by REGISTERED/G.P.O.GAMBIA cancels. 1902 (circa) divided back picture postcard in fine unused condition depicting 'The Upper River'. 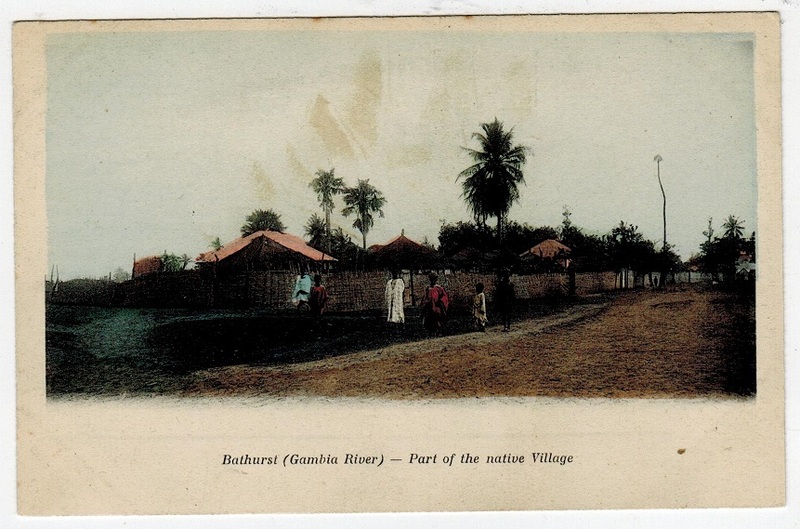 GAMBIA - 1902 (circa) unused postcard. 1902 circa coloured (undivided back) picture postcard in fine unused condition depicting 'Bathurst-Albion Square'. 1902 circa coloured (undivided back) picture postcard in fine unused condition depicting 'Bathurst-River Side'. 1902 circa coloured (undivided back) picture postcard in fine unused condition depicting 'Bathurst-Part of native village'. 1902 (circa) divided back picture postcard in fine unused condition depicting 'Sainte Marie-One of the main streets-Bathurst'. GAMBIA - 1951 cover to USA used at CAPE ST MARY. 1951 (MR.3.) 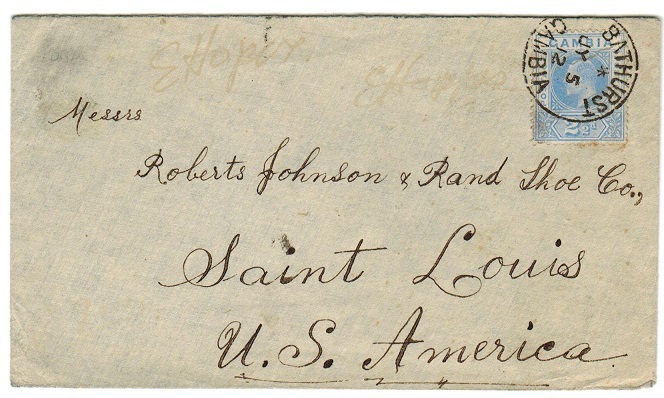 cover addressed to USA bearing 3d adhesive tied by d/r CAPE ST MARY/GAMBIA cds with SAINT LOUIS M.O. arrival b/s.